Following the rumor that Samsung is secretly developing the Project Valley, also known as the foldable smartphones, we are looking into angles why the company, if true, is pushing for the project to materialize. A foldable smartphone with dual-screen might sound ridiculous for now, but we’ve seen this movie a few times. Long ago, dual-screen computers sounded funny, but it ended up providing great help in multitasking at the office or providing wider perspective even gaming. 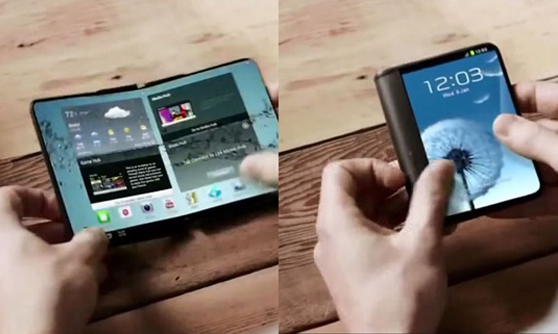 So, there’s no telling that foldable smartphone could be the next generation smartphone. Here are the great features of a foldable smartphone we’ve overlooked. Since we’ve got two screens that can probably work independently at the same time, we can now better share our screen especially when watching a movie. Just flip your phone back to back, let it stand like a table calendar, then you and your friends can watch from other ends of the table. Or, it could turn into one display and enjoy watching on a bigger screen, like a mini-tablet. The manufacturers’ greatest challenge today is to satisfy every consumer with the camera features. It’s like the only thing people really care about when buying a smartphone. We’ve seen dual-cameras solved that problem. Huawei’s even got three! With dual-phone, this could mean better camera not only the rear but also the front as well. Dual-lens, Dual-filter, and dual-image processing only mean better selfies. Some camera’s today, like Nokia, allows the front and back camera to operate at once. We can expect the same functionality from a foldable phone. Durability will also improve when having a foldable phone. Since you can hold your phone like a closed leather wallet, an accidental trip to the floor will less likely result in a cracked screen. Gorilla Glass has been improving over time and more resistant to breaks than ever before. The only considerable concern is the sandwich type folding. Two screens rubbing each other is not at all good news. When LG introduced the mini-app windows and dual screen, multi-tasking for Android has gotten better. We no longer have to worry about sacrificing a little bit of display just to multitask in our mini-screen, because we’ve got two full screens. Running two apps at once both in full display and potential could be the foldable phone’s main selling point. Imagine browsing Facebook while watching Netflix on the other. Or play video games and chat with your crush at the same time. Double the fun, double the price, and double the weight. Those are the things that first come to mind when thinking about having a foldable phone. This could mean good news for smaller manufacturers to finally outsell the bigger ones. Consumers will surely stick to practicality that serves almost the same features. If Samsung is truly committed to making this work, then they’re probably going to stick with low-end phones to ensure affordability. However, it is highly probable that folding phones will be available on the market sooner or later. There have been whispers that Apple is also secretly developing foldable iPhones.